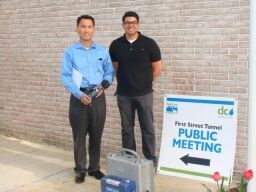 The First Street Tunnel Project seeks to reduce surface flooding and sewer backups in Washington, D.C. the result of intense rainfalls. KES acts as an onsite authority on water treatment and management, with a full time engineer in place who serves as an integral member of the project team. KES provides a full suite of environmental management services including a water treatment plan, SWPPPs, a noise and vibration control plan, hazardous waste management plan and an erosion and sediment control plan. KES manages all permitting aspects of the project, served as an authority on regulatory compliance requirements and on-the-job training to ensure compliance is able to be met by each and every worker.